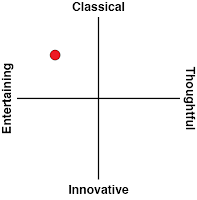 I like to write fairly in-depth reviews. Part of it is that I like to think quite deeply about games, and therefore when I have a chance to write about any game, I want to put words to my thoughts about the game. The other reason is that I believe that even when a game is poor, a lot of work goes into it, which means that it deserves the respect of a full review in turn. 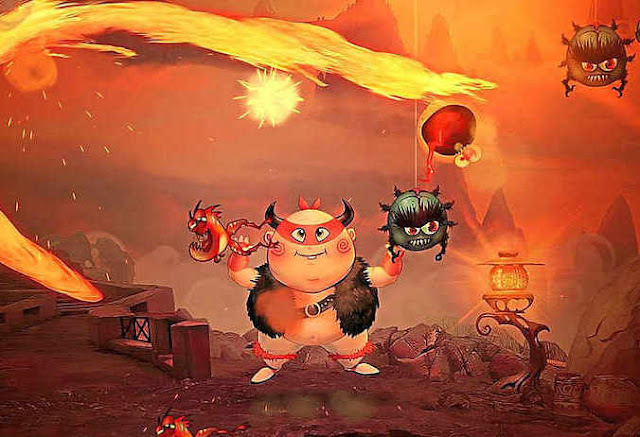 Fire Fu is a game in the spirit of the likes of Fruit Ninja. On the screen you'll see hordes of enemies either fluttering past, or running along the ground. These enemies move either right to left, or left to right, across the screen. Your goal is to defeat these enemies by drawing lines of fire on to the screen, which damage and eventually kill them. Now, the enemies themselves are a fun bunch, and there can be dozens and dozens of them on the screen at once. 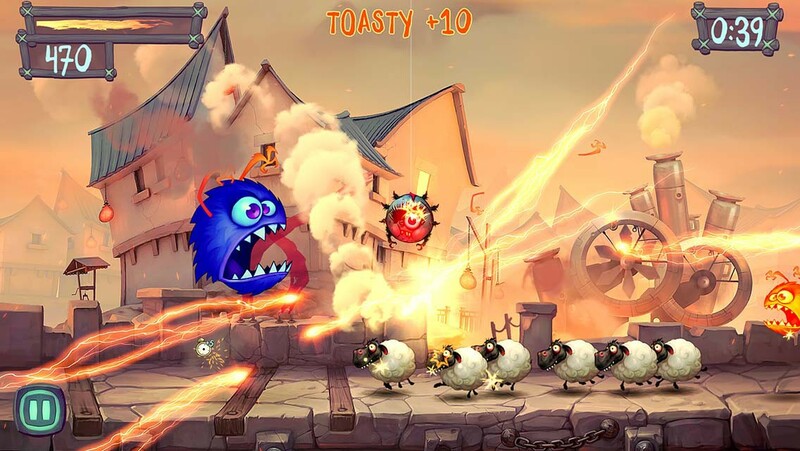 From ugly fish things to balloons that expand and explode when defeated, right through to cute sheep that run around in packs (just because), there's a lot of variety in enemy patterns, too. Some enemies will be defeated the moment they come into contact with some flame. Others need some dedicated rubbing to destroy. The one enemy that you need to watch out for is the bomb, which has a habit of floating in in the most inopportune moment. Damage the bomb and it will wipe a whole lot of points off your total. The goal in Fire Fu is to get as many points as possible in a couple of minutes, with your best scores being stuck up on the online leaderboards. There are some limited opportunities to extend the time limit (there's a fairy that will occasionally appear on screen, defeat it for some extra seconds), but for the most part this is a game that can be over in the length of time it takes to take a bathroom break, and that's more-or-less the point of it. The game does succeed in getting the visuals right. Without being offensive in any way, the level of detail in the game's environment and enemies is superb, and the animation standard is slick and highly refined. The lines of fire that you'll be tracing on to the screen are especially impressive, with some dynamic, albeit brief animation and a solid sound effect to back it up. Unfortuantely the art direction is largely to waste, as there isn't any context to the game to draw me in and make me care. Fire Fu doesn't offer a generic background and plain fruit to destroy, à la Fruit Ninja. Fire Fu has an exotic setting that, while common, is begging for some kind of narrative to contextualise what you're doing. It wouldn't have needed to be much - just some sense of character to give the character of the art direction some meaning. Indeed, the only progression that the game offers is boss battles, and those don't have any context either - they're simple unlocks. 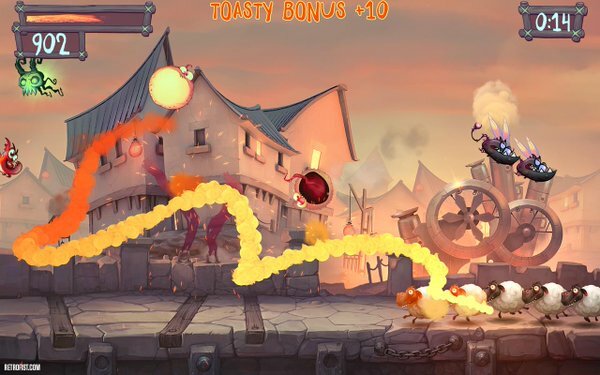 And given that the only thing that really differentiates Fire Fu from the dozens of other Fruit Ninja clones is that art direction, I really struggle to see the kind of audience that this game is targeting. Fruit Ninja itself isn't even that new any more. If you're going to take on an incumbent without bringing significant innovation to the table in order to redefine the genre, you really need to hone in on a strength and make it the reason people come to your game. 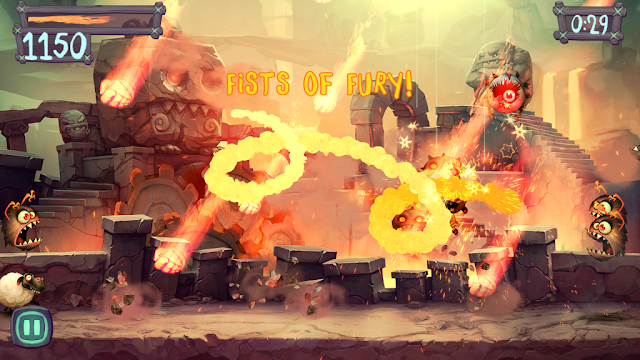 Fire Fu plays it too safe, offering gorgeous art direction, but then fearing to do anything substantial with it. It's a good game, don't get me wrong. On an objective level it works, and there's a reason Fruit Ninja and other such games have been so popular over the years; they're a great deal of fun. The problem with Fire Fu is that it is just so very late to the party, that even an Asianophile like me struggles to get along with it over its genre ancestors, despite the Asian setting and theming. So, how did I go, readers? 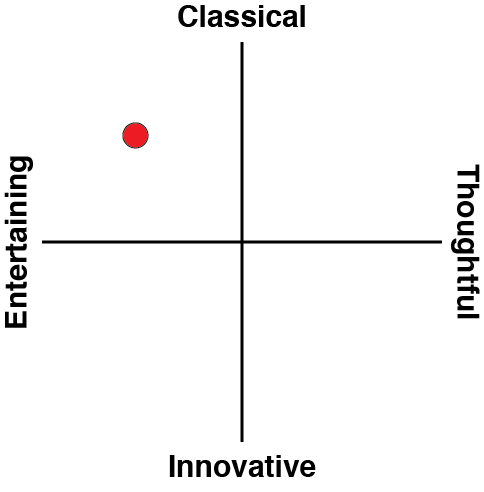 Did I achieve enough depth in this review? I'm rather proud of myself, that's for sure.